This essay is a cursory introduction to the long anarchist histories of mutual aid, specifically in the context of responding to disasters or crisis, so that we, as contemporary anarchists, may see ourselves as building on these traditions. Readers are encouraged to research these sketches for themselves, to explore the rich depths of shared responsibilities that we have within our milieus. Cooperation or mutual aid among various human and non-human animals has been documented over the last 100 years in many disciplines including anthropology, social theory, politics, and evolutionary biology. Despite living under economic and cultural systems that reward sociopathic behavior such as self-interest and narcissism ( your average Fortune 500 CEO and politicians are examples), that are continually reinforced by the media, culture industry and economists, voluntary cooperation for mutual benefit still appears at every turn in many forms. People do care for each other and willingly work together for their mutual betterment in a variety of ways. For anarchists, Peter Kroptkin’s seminal Mutual Aid, published in 1902, became the starting point for naming collective endeavors and giving them a social and political reference. Mutual aid in times of disaster appears in the early days of the 1917 Russian Revolution with the formation of the Anarchist Black Cross (ABC). The organization broke from the relief efforts of the International Red Cross (IRC) in Russia and the Ukraine shortly after the revolution because the IRC refused to support prisoners, especially anarchist political prisoners, who were in dire need of medical attention and food. The ABC worked to alleviate this problem, with autonomous chapters springing up world wide. Members provided material aid, and calling attention to prisoners’ plight. Autonomous ABC chapters continue to support political prisoners. In July 1936, fascist generals, led by Francisco Franco, attempted to overthrow the elected Spanish government, provoking what is generally known as the Spanish Civil War, but referred to by anarchists as the war and social revolution in Spain. In the midst of social and military turmoil, through decentralized collectives and federations predicated on mutual aid and solidarity, many of the basic needs and more of the population were met. Anarchists began organizing in Spain in the 1880s, and millions of people across Spain were able to participate in working together in the cities and in the countryside to fight fascism and at the same time, reorganize civil society along anarchist ideas. They were ultimately crushed by the collusion of fascists and Communists, but for three years they provided thousands of examples of how mutual aid in disaster and crisis could exist within an anarchist framework. During the anti-nuclear movements of the 1970s and ‘80s, many anarchists practices were adopted in mobilizations across the US, from places as diverse as the Clamshell Alliance in New England and long occupations of the Nevada nuclear test site among many others. In addition to using decentralized organizing, power sharing and affinity groups, the movement saw the birth and growth of two strands of decentralized mutual aid—street medics and Food Not Bombs. Street medics (those with varying degrees of medical practice from first aid training to doctors) had attended protests since the late 1960s, but now took active roles in supporting people who had been tear-gassed, beaten, trampled, or injured by law enforcement brutality at mass demonstrations. Food Not Bombs (FNB), rooted in its decentralized network of autonomous chapters to feed people worldwide, also became active in the early 1970s anti-nuke movements. FNB feeding people under duress was a common sight at the anarchist-led protests in the streets as well as in deserts of indigenous lands of Nevada. The influence of anarchism had been gaining ground in the US since the 1970s, but accelerated rapidly in the 1990s. When the World Trade Organization met in Seattle in 1999, anarchists were at the forefront of the mobilization against neoliberal policies of corporate globalization. A large scale anarchist renaissance emerged at successive massive summit protests in North America. Attended by tens of thousands of people, these mass mobilizations brought anarchist ideas and practices, including mutual aid and solidarity to the forefront to the extent not seen in the US in generations. This lead to the growth of large, informal anarchist networks of street medics, legal, communications, and direct action collectives. Mutual aid for the 21st century, built on anarchist traditions, began to look different after the turn of the century and its rocky first decade. Disasters (both manmade, economic and ecological) took their tolls on the psyche of the people in the US , but something important emerged along the way: frontline grassroots, decentralized cooperation in dealing with these disasters outside of the state and the non-profit industrial complex. When Hurricane Katrina struck the Gulf Coast in fall of 2005, people worldwide could see the failure of the US government and Red Cross response. The state criminalized desperate people, prioritizing restoring “law and order” instead of rescue and relief efforts. The Red Cross, with all its resources, was woefully inadequate and unresponsive to the dire needs, but managed to raise a billion dollars in donations in a few short weeks. From the outset, a few of us activists on the ground asked questions: Could these informal post-Seattle networks like street medics, Indymedia, Homes not Jails, Food Not Bombs, etc., be called to participate in disaster relief? Could street medics form a clinic; could that clinic become a hospital? Could Food Not Bombs feed people for the long term? These questions led to reaching out to those networks for supplies, people and resources. Decentralized relief efforts sprang up out of this chaos. One of them was the Common Ground Collective, formed soon after the hurricane hit, in the Algiers section of New Orleans which became the largest anarchist inspired organization in modern US history. Common Ground’s foundational premises were simple: mutual aid and solidarity, expressed through the slogan “Solidarity Not Charity.”Medics and health professionals, legal teams, Indymedia reporters, open source computer programmers, micro radio installers, eviction defense activists—organizers and volunteers came from these networks, bringing supplies and other people to support communities by providing relief and rebuilding, letting people determine their own futures. Volunteers engaged with individuals and neighborhoods on varied projects from armed community defense against white racist militias, gardens, neighborhood assemblies, and trash clean-up to free schools, house gutting and eviction defense. What made Common Ground different than most other relief models was that mutual aid and resistance to authority were consciously woven into its analysis and most of its practice in building collective liberation. Over 28,000 volunteers came through the project in the first three years to support these communities that had been devastated, neglected and ignored even before Katrina ever hit. It was a mutual aid after crisis for the 21st century. The Common Ground Collective was a manifestation of these ideas, but it was to have a reverberating impact outside of the Gulf Coast, both through the stories of organization and because tens of thousands of people had participated in the project over the years. The next disaster anarchist mutual aid addressed on a large scale was a human created economic one: In 2007, Wall Street bankster greed and financial Ponzi schemes created a financial meltdown in the US causing massive job losses, collapsed businesses, and evaporated life savings, leading to large scale home foreclosures and evictions. Spontaneously, it seemed, thousands rose up to retake public spaces by reclaiming the commons, gathering together in mutual aid in city after city. 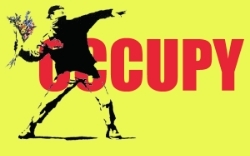 Millions of disaffected people supported the various movements under the umbrella name Occupy in September 2011. Again, much like the efforts after Katrina, different communities came together, working cooperatively to defend themselves, feed each other and share experiences. Mutual aid emerged within urban park Occupy campsites, in eviction defense actions, factories and street protests across the country. Organizers and volunteers who had been active within Common Ground were part of the Occupy decentralized organizing networks, building further on the ideas of mutual aid and solidarity. Human induced climate change continues to make erratic weather patterns the new normal. Hurricane Sandy, a super storm, struck the US East Coast in October 2012 with devastating effect in numerous states. Much like Katrina, once the storm passed, the government and Red Cross response was abysmal in more marginalized communities. The momentum from people within the Occupy movement founded the decentralized effort of Occupy Sandy rooted in the models of Common Ground and other radical movements, as embodied in the slogan, “Mutual Aid Not Charity.” Volunteers became first responders, where government agencies failed to and went to ignored communities, helping to set up programs and projects or supporting ongoing efforts. After the immediate crisis abated, many within Occupy Sandy continue to support communities in their rebuilding efforts for self determination. The ideas and practices of mutual aid are alive and well in the 21st century. Our capacity to put our emergency hearts into action, together, will continue to propel us forward at mass mobilizations, in parking lots, within prisons, in community centers and disasters. Humans are wired for it and it’s critical to maintain in our atomized and often destructive society. Disasters especially will be at the forefront in some communities; being able to respond with mutual aid is central when they strike. For instance, in May, 2013 , a massive tornado devastated parts of Oklahoma—more of the new normal created by the rapidly changing climate. People from the Occupy movements and ex-Common Grounders, anarchists and other radicals, once again set up decentralized mutual aid support for immediate relief and longer term rebuilding. These spontaneous outpourings now have connected networks to rely on quick responses; histories to build from and people who bring experience in dealing with crises and power sharing skills. For those of us engaged in anarchist organizing, the long histories of mutual aid and solidarity around disasters should consciously be added to how we view collective liberation . Sadly, these disasters glaringly and painfully reveal the state’s failures and often affect communities more than any single issue. But, they also open a crack for people to see themselves and their own power by rebuilding small pieces of their communities differently than before through mutual aid. In direct and meaningful ways, people learn that they do not have to wait on those in power to make their lives better. They begin to realize that they can do it for themselves, with support; even in the worst times. These concepts, which are as old as life on this planet—that anarchists politically name as mutual aid—will continue to be needed for the survival and health of all of us in our day-to-day lives as we face uncertain futures; whether it’s disasters, crises, or just living.